An announcement on the KNAB website says that two private individuals and a company – according to LTV, it's the Per capita limited liability company – are involved in the case. 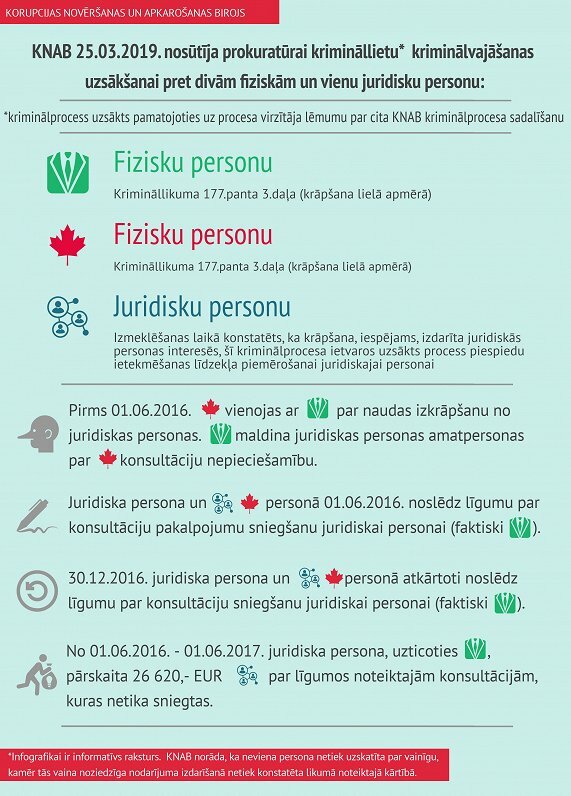 As always, the KNAB announcement was accompanied by a cryptic infographic, with Zakatistovs - a dual Latvian and Canadian citizen - apparently represented by a maple leaf symbol. According to his CV, during his academic career he has taught courses on "Business ethics", "Management ethics" and "Argumentation and lobbying". As reported, in June 2018 Zakatistovs, Tamužs and MP Artuss Kaimiņš (KPV LV) were detained as part of an inquiry into an illegal party financing scheme. Back then, KNAB said it had obtained materials containing information about alleged criminal offenses against property, which resulted in the political organization receiving illicit financing. The bureau likewise outlined a fraudulent scheme – apparently illustrated in the new infographic – dating from the spring of 2016 involving bogus contracts for consultancy work, a series of bank payments between companies and one individual receiving payments of 2,000 euros per month and an implication that the position of Minister of Economics was a bargaining chip on the table. "A large amount of financial fraud was used to illegally finance a political organization. In addition, it was clarified that a deputy of the Saeima indicated false information on a large income in an official statement for the year 2015," KNAB said.